You are here: Home 2012 March Soy reducing risk of prostate cancer. Dr Weeks’ Comment: Its simple. It’s soy. For treatment, though, consider soy in the fermented form. Prostate cancer is the 4th most common type of cancer worldwide””however, the incidence of the disease varies geographically. The United States has one of the highest rates of prostate cancer. According to the American Cancer Society, more than 240,000 men are diagnosed with the disease every year, which translates into more than 2 million prostate cancer survivors currently living in the U.S.
Asian countries, on the other hand, have significantly lower rates of prostate cancer. The difference in the rates of cancer in the U.S. and Asian countries are due to a number of factors, including screening, genetics and environmental influences. Epidemiologic studies have tried to isolate the impact of genetics and environment by examining the incidence of prostate cancer between men of Chinese descent living in either China or the U.S.
Interestingly, those living in the U.S. had a ten-fold higher incidence of cancer. Similar studies have found identical trends in Japanese men, which suggests a significant role of environment in the onset of the disease. Diet is one factor which has been presumed to pay a key role in reducing the disease rate in Asian countries. In particular, it has been hypothesized that the high intake of soy in these countries may be responsible for the lower risk of prostate cancer. Soy is a unique dietary source of isoflavones, such as genistein and daidzein. These compounds act like the hormone estrogen in humans and have been found to inhibit tumor cell growth. Genistein, in particular, has been targeted as a potent anti-cancer compound. In cell culture studies, researchers have shown that genistein inhibits prostate cancer cell growth and also induces cellular death. Additionally, studies have demonstrated that genistein enhances the ability of radiation to kill prostate cancer cells. Similarly, rodents fed a diet high in soy were less likely to develop tumors and those that did develop prostate cancer, tended to have less aggressive disease. Specifically, these findings were attributed to a substantial increase in apoptosis, cell death, and decrease in tumor vessel development. Large population studies have also illustrated a strong relationship between soy consumption and reduced prostate cancer mortality. More targeted controlled studies, however, have been inconsistent regarding the effects of soy on prostate cancer. Notably, these studies are limited by small sample sizes and short durations. Regardless, the American Cancer Society recommends eating soy to reduce one’s risk and the National Cancer Institute has been actively investigating isoflavones for decades. 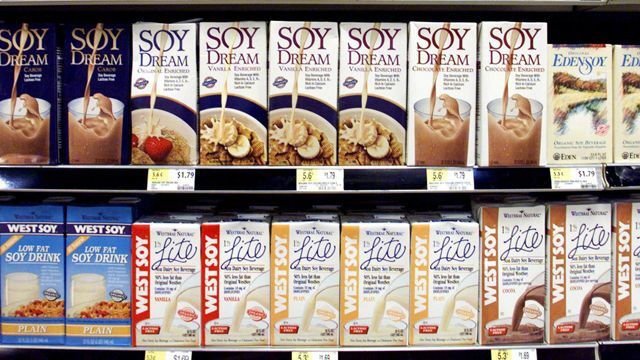 A high soy diet has many potential benefits besides reducing cancer risk. In addition to its potential chemo-preventative effects on prostate cancer it can also help reduce cholesterol and heart disease. Replacing 40 grams of meat with protein can reduce LDL or “bad cholesterol” by up to 10 percent. At the same time, substituting fatty protein sources with soy can help promote weight loss and curb obesity, another risk factor for prostate cancer. For instance, exchange a beef burger for a soy burger, which adds 12 grams of soy protein to your diet while reducing the calorie content by more than 50 percent. While there are many benefits associated with soy consumption, recent research has also demonstrated some potential risks. Since isoflavones can act like the hormone estrogen, they can disrupt ones natural hormone production. In women, this can result in abnormal ovulatory cycles interfering with one’s fertility. Additionally, some experts believe children should limit their soy intake because the estrogen-like compounds may upset normal sexual development. As a physician, I recommend moderate soy intake to maximize health benefits. Additionally, choosing natural sources of soy such as soy beans, soy milk or tofu are preferable to supplements or processed foods. However, it is important to clarify that while soy may prevent prostate cancer it is not a treatment. Even if you consume a diet rich in soy products it important to get screened for prostate cancer and if diagnosed it is critical to partner with an urologist to develop a comprehensive treatment plan that best fits your goals.